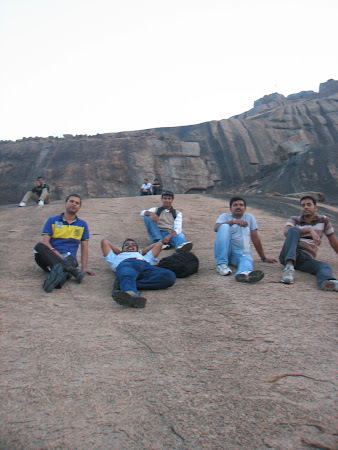 Nijagal Betta has been one of the oft-visited peaks by our team. It is situated off Tumkur Road, after Dobbspet. While driving from Bangalore, you need to take Tumkur Road, cross couple of toll booths and drive straight towards Tumkur till you see a Kamath on your left hand side...well the hill is not next to Kamath. However after Kamath Restaurant, you can drive a bit slow and keep an eye on the left hand side. A couple of kilometers ahead, you can see a gate on the left side and a board erected next to the Arch. A small drive after that left turn would take you to the railway track. The railway track is manned and ia often closed. 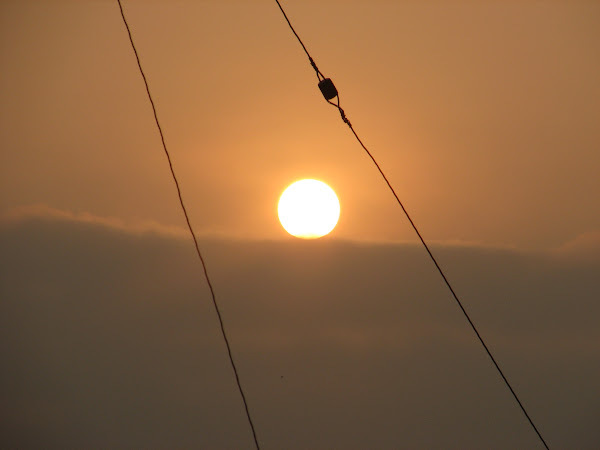 Once we had reached the railway track before the Sunrise. We saw that the railway gate was closed, which in an ideal world would signify that a train would be approaching in some time. The wait took longer and there was no sign of a locomotive. We proceed to a hut near the railway gate and found someone sleeping inside. Woke him up to ask him when would the train cross that point. He was aghast "Why do you wish to catch the train here?". "No we do not want to catch the train, we are just waiting for the train to cross so that the gates would open and we could drive through." "ohh, don't worry, I will open the gate anyway. There is no train coming". Apparently he closes the gate every night so as to avoid possibility of anyone crossing the track while he is asleep. There is a path below the track for bikers to cross by. The first time when we went to the place, we climbed a hill which was in front only to find later that we have reached a wrong hill. 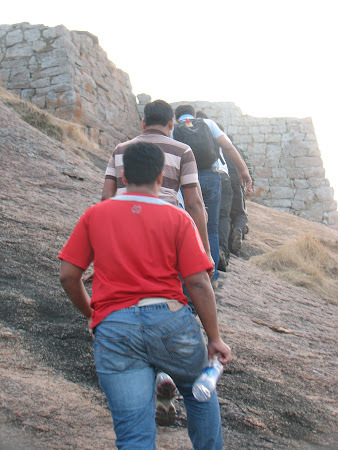 Climbing down was not an easy way as we had no path in front and trekking backwards might have been longer. The hill with the forte was in front of us and we took the shortest possible path, albeit it went through shrubs, bushes and thorny plants. Finally we were down and then again on our way up towards the forte at the top of the hill. The incline til the first set of walls was not steep but once there, the rocks ahead were steep enough for us to walk close to the rock, holding the edge to hold ourselves in safety. The higher we went,m the steeper was the climb. The the height of the hill is not a lot, it is exacting enough to make one think twice before climbing. No wonder the place was venue for a gory war and Maratha warriors were pushed back by the incumbents of the forte. As with any other hill, the view from the top is amazing, the breeze soothing and the rocks comforting enough to seduce you to sleep. Beware, there are Monkeys to accompany you so do not leave any bag unattended. There are some structures made on top of the hill, which can be climber upon as long as you do not have someone bulky enough with you, who can pull(or push) down a couple of bricks in his effort to climb on top of these structures. 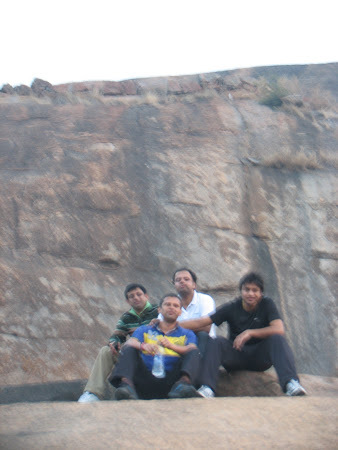 We were done with teh sleep and were sitting on top of the hill munching peanuts when some one suggested "Why don't we try the set of three hills in font of Nijeggal bitte on the other side of the highway and we had our plan for next trip ready.